Many apologies for the lack of posting last week–I had a winter weather related injury and I’m still sort of recuperating. More on that another day…maybe. If you live in the Northern Hemisphere, you are undoubtedly experiencing plenty of very cold and yucky weather (apparently the Southern U.S. isn’t even immune this year!). I think THE ONLY good thing about this weather is that it gives me plenty of excuses to make soup. Especially this soup. I’ve made it a couple of times already this winter and I think it is delicious. Enjoy! Toss the beef in the flour. Refrigerate beef for 20 minutes (this helps retain the flour coating during the subsequent frying step). 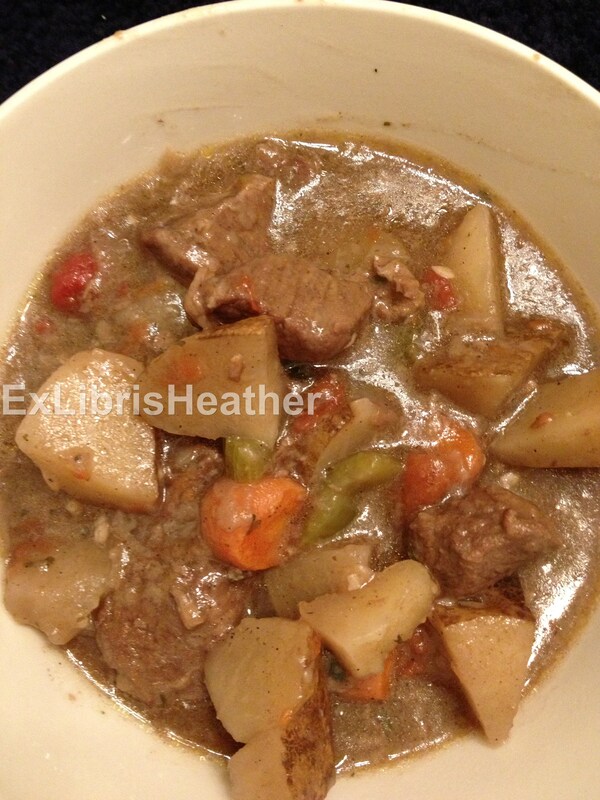 Put potatoes, tomatoes, carrots and celery in the crockpot. Heat a frying pan up on medium-high and add in about 2 tablespoons of oil. Next, add in the garlic. Cook garlic for a minute or so. Then, add beef to the pan. Cook beef for 4-5 minutes, stirring twice. The beef should be seared on both sides, but not necessarily fully cooked. Remove the pan from the heat and transfer the seared meat to the crock pot. DO NOT clean the pan. Return the pan to hot stove top and add remaining 2 tablespoons of oil. Once oil is hot, add in the onions. Cook the onions for about 3-4 minutes. Add in cooking wine and beef broth, and heat to boiling. While the liquid is heating up, add in the spices, except the bay leaf. Once the liquid begins to boil, turn off the heat and pour entire mixture into the crock pot. Add the bay leaf. Stir soup to combine and cook on low for 9-10 hours, medium 7-8 hours, high 6-7 hours. About 30 minutes prior to serving, ladle out about 1/2 cup of liquid from the stew. Whisk in 2 tsp cornstarch and add it back to the stew, stirring gently to combine. You can substitute the red wine for an additional cup of beef broth if you don’t have/don’t want to use the wine.